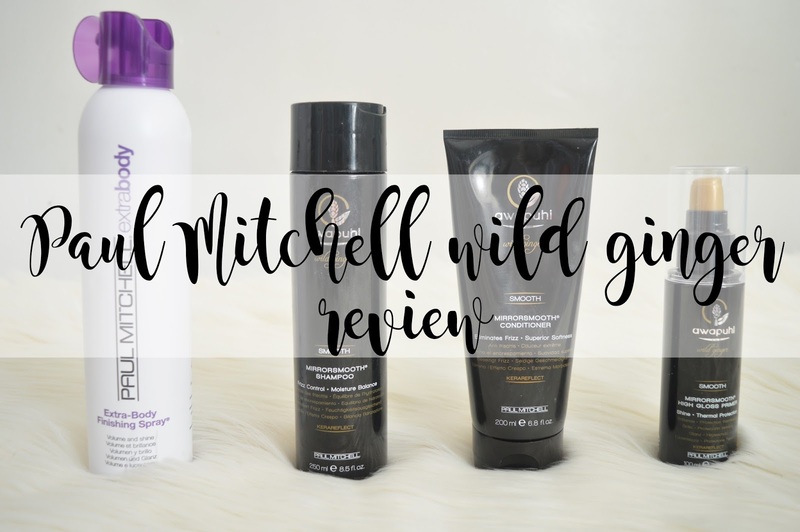 A while ago, and when I say a while, I think it was back in September; I was sent a few products by the brand Paul Mitchell to try out as I suffer with dry, dead and frizzy hair. One of the products they sent me I actually featured in my October Favourites because I was enjoying it so much and it's a product I use every single time I wash my hair now. I try not to use the shampoo and conditioner every time I wash my hair, as if you use the same brand every time your hair becomes immune to it! Very similar to if you take the same medication for a long period of time, it no longer works! The range I was given is part of the "Awapuhi Wild Ginger" range and within this range there are three different types of treatment - Repair, Smooth and Style. Having dry and frizzy hair, they believed the "smooth" range would be the best suited products for my hair. I was very skeptical at first when it came to trying these products as you always find brands which say "This shampoo will make your hair thicker" or "this shampoo will stop frizz" but do they ever work? Really? I have never found any of the brands you find in a supermarket to work and do as they say on the bottle! The Mirror Smooth Sampoo and Conditioner are classed as frizz control and moisture balance products which is exactly what my hair needed and although feeling skeptical, I was very excited to try these products out too! However, I didn't want to just try them out for a week and give an honest, but not realistic review. I have used these products at least twice a week for two months and I feel I am now ready to provide you with the most honest, realistic review you will ever see when it comes to hair care! The Paul Mitchell Awapuhi Wild Ginger MirrorSmooth range includes a "gentle, sulfate-free shampoo with rich foam restores the hair's optimal moisture balance and leaves locks silky-smooth". As well as a conditioner which "hydrates, instantly detangles and creates a shiny, reflective finish". So how does it work? These products include KeraReflect™ blend with natural Abyssinian oil replenishes moisture, smoothes the cuticle and boosts shine. Sounds intriguing doesn't it! I cannot pin point what the exact scent is of these products, but they smell absolutely incredible and even my boyfriend knows when I use these two products in my hair because the scent is so strong even once you have dryed your hair! Everyone I see in my day-to-day life has also noticed a considerable difference in my hair once I have used the shampoo and conditioner. Not only does my hair dry dead straight but it looks healthier, softer and less frizzy too! If I could name any of my products in my household to be a miracle, these would be them products! I didn't think I would see a difference in my hair while using these in my hair care routine twice a week, but even after the first hair wash my mum new instantly that I used a different shampoo and conditioner on my hair. It's insane how a couple of products can make such a difference to how healthy your hair looks. I also use the High Gloss Primer every single time I wash my hair, whether I am using the mirrorsmooth shampoo and conditioner as well, or if I use my trusty tresemme. This primer obviously "primes the surface cuticle of the hair for a smooth, shiny, polished look and controls unruly texture". As well as this, Paul Mitchell also states how this product also "has a Humidity-resistant formula creates a smooth finish in any weather and prevents thermal damage". Which is exactly what you need in every weather! If the weather is hot, my hair goes fluffy. If the weather is cold, my hair goes very dull and I would say flat and just kind of gross. I love using this product every time I wash my hair because not only does it give me the amazing smelling hair, but it also means I have some sort of protection on my hair before drying it, without having to use another product as a heat protector! Last but not least, Paul Mitchell also kindly sent me the Extra-body finishing spray which basically acts as your normal hairspray however it secures hard-to-hold hair, fights frizz, boosts volume and adds shine. I have been using this spray on days when my hair is in the mood to be curly and I want my curls to last all day with lots of volume. Or I have been using this on days when my hair is still slightly frizzy when I haven't used the mirrorsmooth sampoo and conditioner so by using this, my frizz is flattened and controlled throughout the day! I have found with many sprays like this you can quite often tell you have some sort of hair spray in your hair as it leaves a horrible texture or some sort of stickiness, however this isn't the case with the finishing spray by Paul Mitchell! You cannot tell when you use this in your hair, it isn't sticky either and it's so easy to brush out as well compared to your usual hair spray you can find in supermarkets! These products are on the higher price range compared to brands such as Head and Shoulders etc, however for a product which you can actually see results from; I would definitely say it's worth paying the money for something which truly works! What's your favourite hair care brand? ooh these products sound really exciting! my hair has been looking pretty dull and dry recently so might have to give these a try!